All Photos on This Web-Site are Copyright?by Hans Norman. All rights reserved. "Airliner Monthly News" issue no. 52, November 1991, then being my first photo to be published. The shot was taken at Stockholm-Arlanda on August 22nd, 1991, as was pointed out in the magazine. 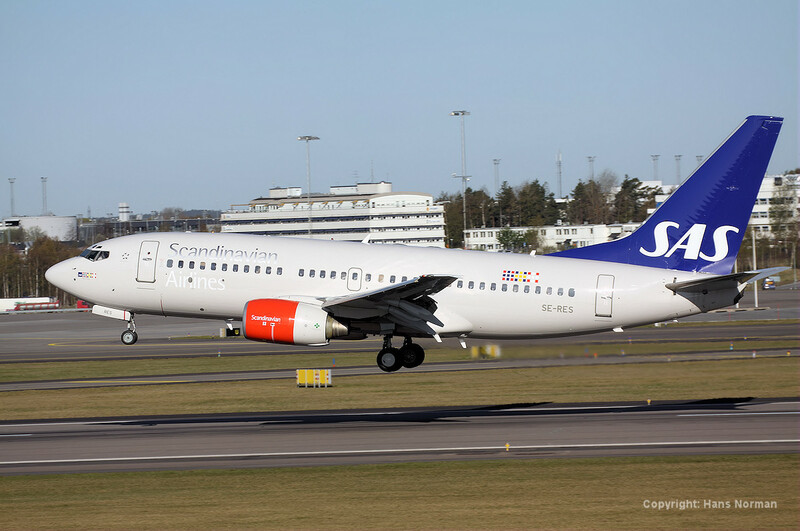 The aircraft was on lease from SAS, and entered service with NEA on August 9th, 1991. 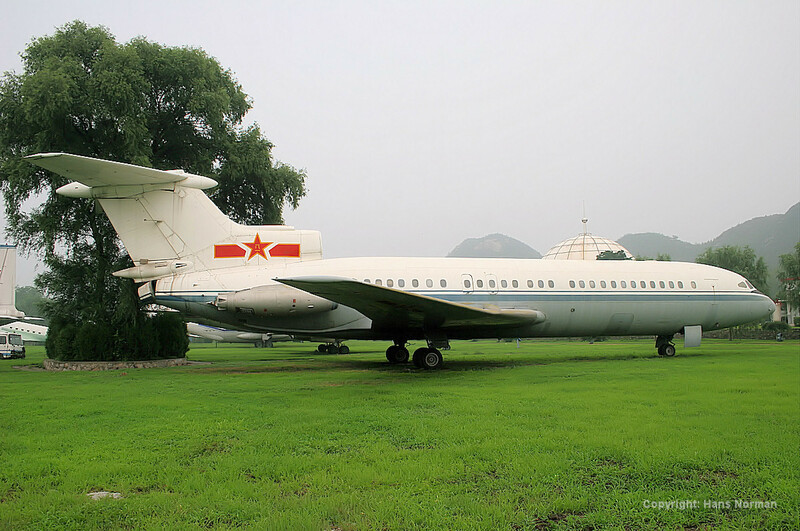 "Airliners Monthly News" issue No. 69, April 1993 . The photo was taken on January 8th, 1993 at Stockhol-Arlanda Airport. One month later, the company filed for bankruptcy, stranding many holiday-makers abroad. The aircraft, being leased, was returned to its lessor. 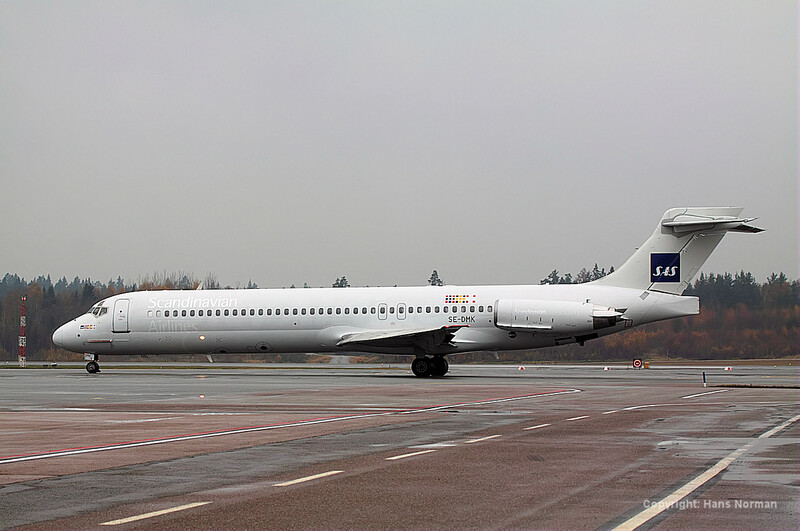 (Time) Air Sweden was a short-lived swedish charter-company operating DC-8:s (passenger- and cargoversions), Boeing 737-200, Lockheed L-1011 Tristars, as well as small IAI Westwind Bizjets. 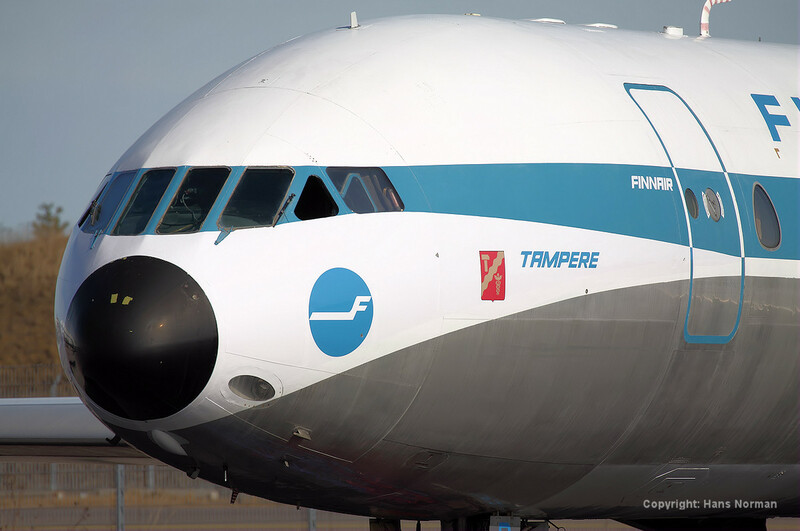 It was set up by one of the true entrepreneurs of Swedish airline-industry, Thomas Johansson, also being repsonsible for establishing Transwede in 1985. "ACARS International Airline and Commercial Aircraft Report" Issue No. 17, 1995. The photo was taken March 29th, 1995 at Stockholm-Arlanda, being towed away from the maintenance area, heading for a new load of passengers. The aircraft is no longer flying under the JZ-code, instead being sub-leased to Icelandair domestic subsidiary Air Iceland. "Airways - A Global Review of Commercial Flight", September 1998. The date is May 23rd, 1998, 16.20 local Hong Kong time, and the worlds first delivery of a Boeing 777-300 is just about to happen as Cathay Pacifics first Boeing 777-367 B-HNH is seconds from touching down "in its new home" at Kai Tak Intl. airport after its delivery flight from Boeing in Seattle . 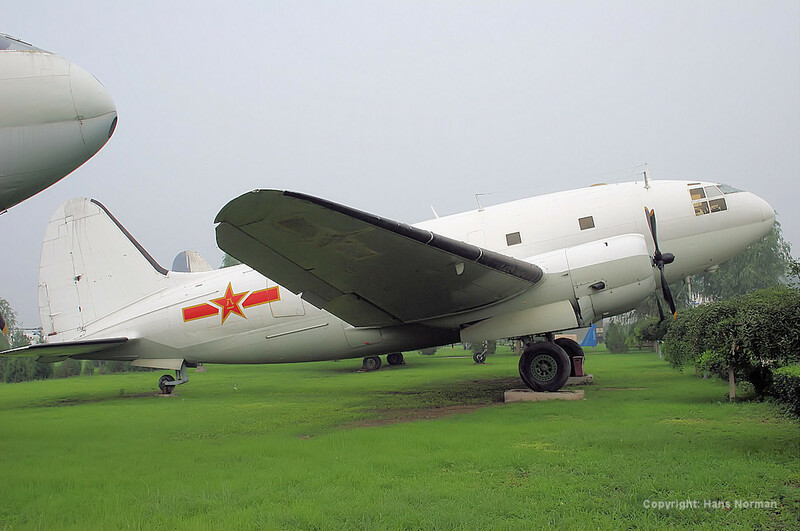 Alas, Cathay Pacific Airways was one of four launch-customers (the others being All Nippon, Thai and Korean Air) and the first company to take delivery of the worlds longest airliner in service. A historical photo of a historical landning. In January 2001, a very interesting and highly qualitative book with the title "LINJEFLYG - from start to landning" was published (written by Michael Sanz). 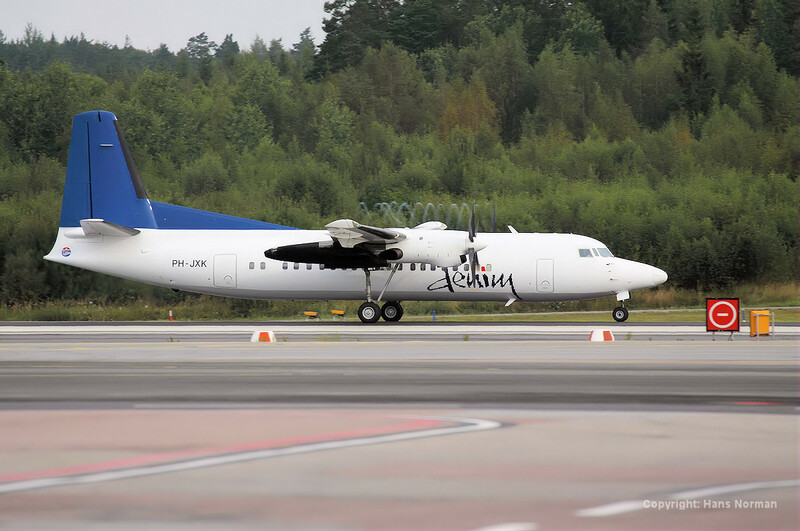 It describes the history of the classic Swedish domestic airline LINJEFLYG, emphasizing the stories from the people who made LINJEFLYG to such a success story. 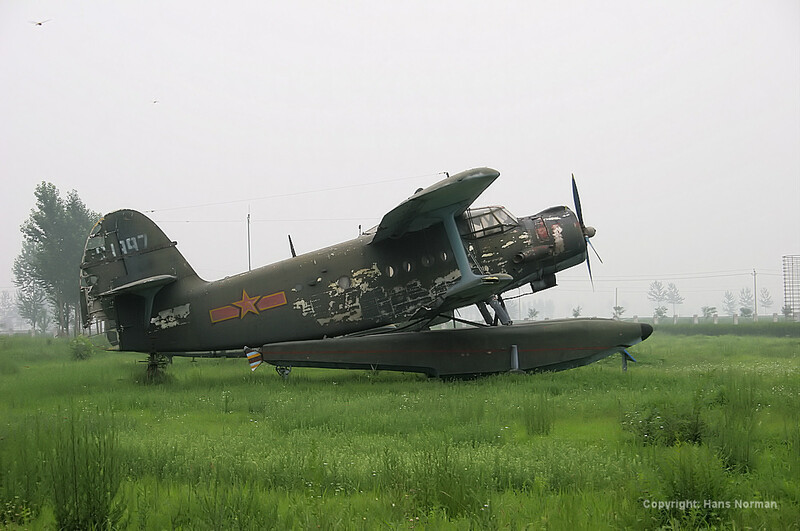 I was fortunate to be allowed to give my (small) contribution to this publication in the form of three photos of Linjeflyg airplanes. The photos shown below have all been choosen for illustration in the book. rwy 26 at Stockholm-Arlanda on March 1st, 1993.
and the photo was taken on a rugged winter day in January 1992. 1992. 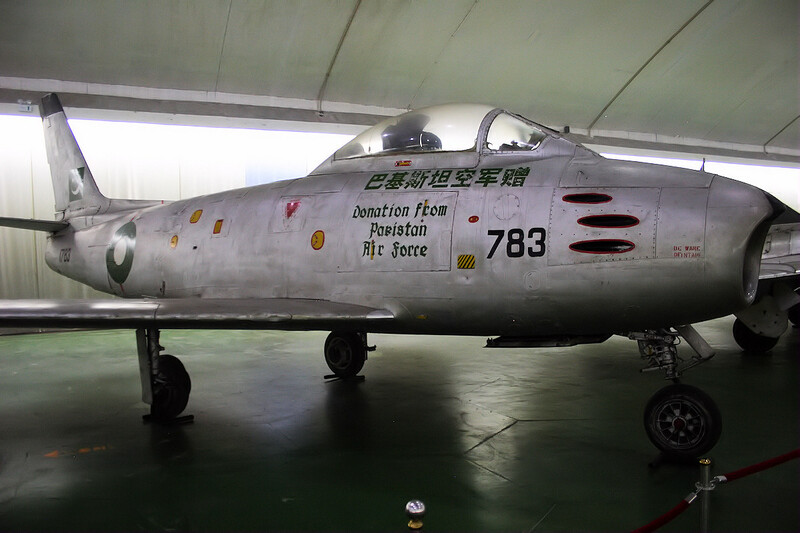 The F28-siloutte is appropriately painted on the hangar wall. "Airliner World - The Global Airline Scene", Issue 2001. The date is May 11th, 2001. A week earlier, bmi has taken delivery of a couple of brand new Airbus A330-200. 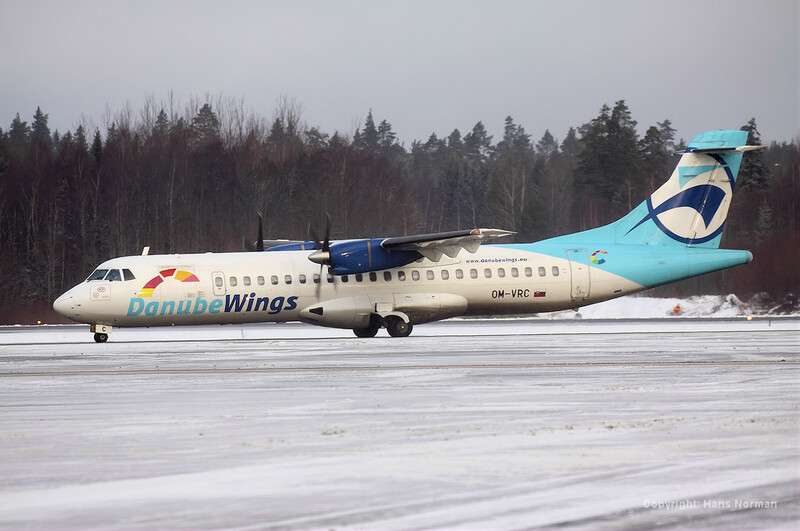 One aircraft, G-WWBD, was immediately wet-leased to SAS Scandinavian Airlnes. 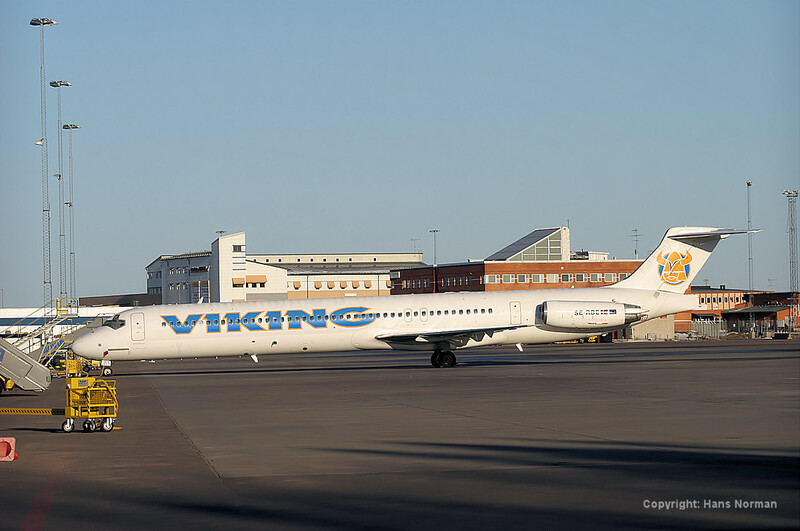 After two days of "trial"-services between Copenhagen and Stockholm-Arlanda on May 11th - May 12th, the aircraft started operating flight SK901/902 between Copenhagen and New York Newark in the afternoon of May 12. 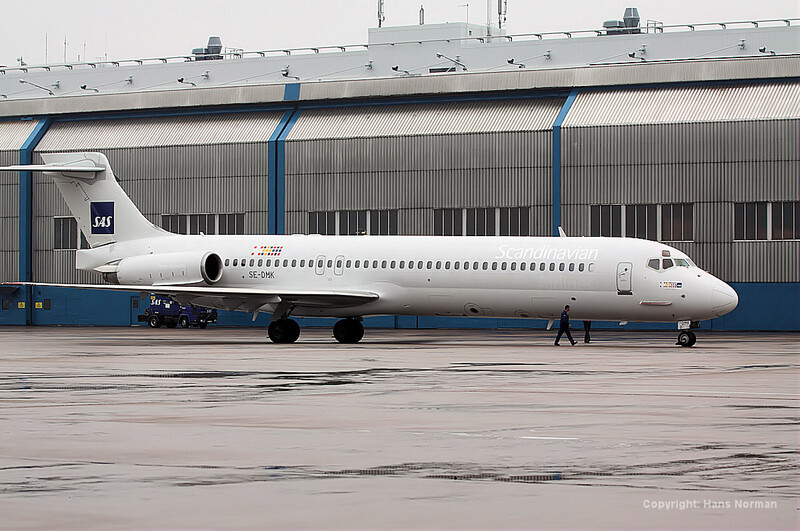 The plans calls for the aircraft to be operated by bmi for SAS until mid-2002. "Airways - A Global Review of Commercial Flight, September 2001". The photo shows the same departure sequence as the earlier bmi A330-200 photot above. "Airways - A Global Review of Commercial Flight, November 2001". I wrote an article about the introduction of the new longhaul airliner, the Airbus A340-300, in SAS. A total of four pictures were published as part of the article, three of which are shown here. All three photos shows SAS' first A340-300, SE-REA, during introduction in August 2001. 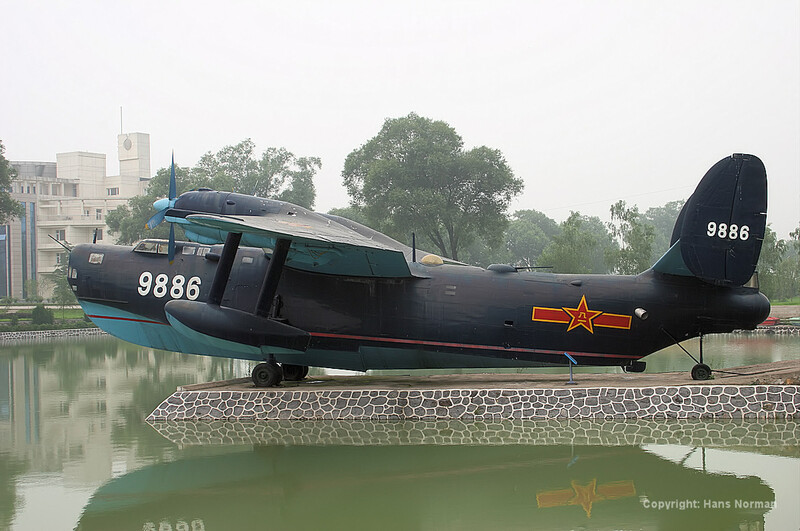 This aircraft has since been re-registered LN-RKF. "Airways - A Global Review of Commercial Flight, November 2001". Airbus A340-300 SE-REA. "Airways - A Global Review of Commercial Flight, November". Airbus A340-300 SE-REA. Flygande Veteraner (Flying Veterans) Douglas DC-3 SE-CFP "Fridtjof Viking"
(Flygande Veteranernas) Yearly Photo calendar for Year 2004! All Photos were taken at Västerås airshow on a very sunny summerday in June 1996. "Ett År i Luften 2004 - Swedish Yearly Aviation Book summing up the important issues in aviation for the last year." "Ett År i Luften 2005" - Swedish Yearly Aviation Book summing up the important issues in aviation for the last year. 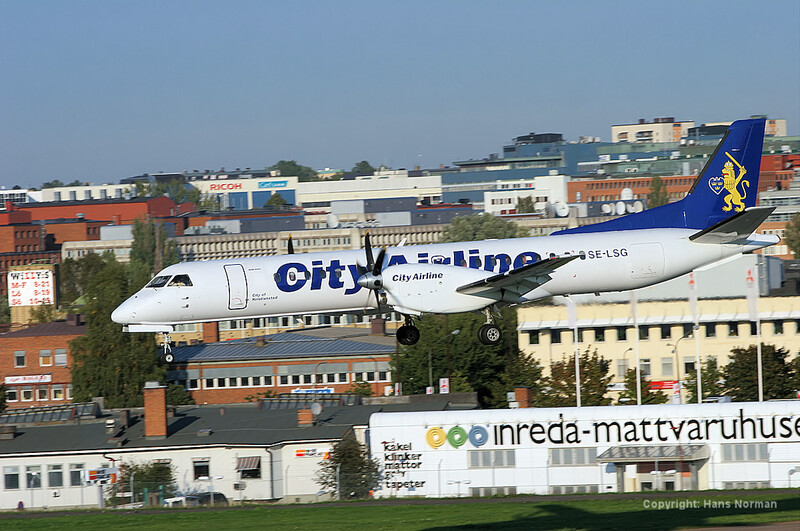 Photo Showing the first Saab 340 operating for airBaltic. Harvard Texan SE-FUC "Mean Machine"
on the front cover and on month JUNE. Hawker Hunter SE-DXM in "Patroulle Suisse"
in after a Flying Display is shown on month JULY. on March 6th 2005. The photo was published in "Svensk Flyghistorisk Tidskrift Issue 2/05". 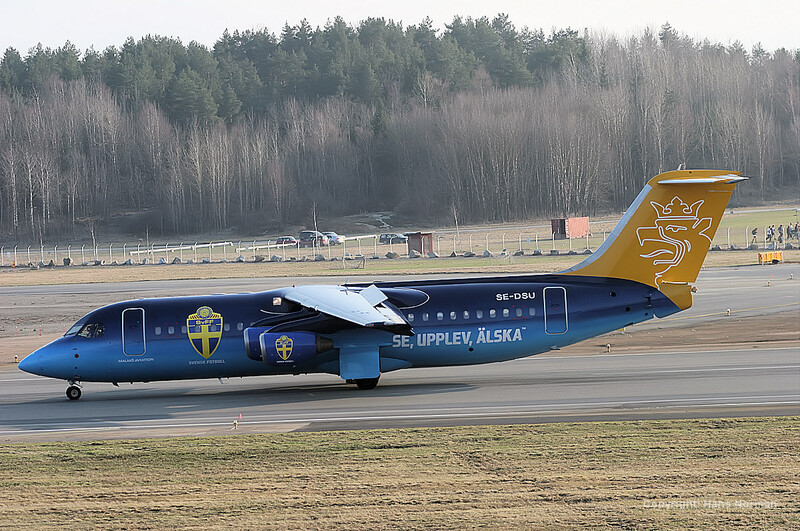 The Revival of the classic Swedish Airline Transwede in the shape of AVRO RJ70 on lease to the company. published in "Svensk Flyghistorisk Tidskrift Issue 3/05". of Commercial Flight, August 2005". to Pakistan. This photo of SE-LLN was published in "Svensk Flyghistorisk Tidskrift 2/06"
as of February 7th 2006. This photo of SE-DOT was published in "Svensk Flyghistorisk Tidskrift 2/06"
in the yearly Aviation book "I Luften 2006 - Flygets Årsbok (Michael Sanz)". yearly Aviation book "I Luften 2006 - Flygets Årsbok (Michael Sanz)". This photo of Sterling Airways Caravelle 10 was published in December 2006 in the yearly Aviation book "I Luften 2006 - Flygets Årsbok (Michael Sanz)". the yearly Aviation book "I Luften 2006 - Flygets Årsbok (Michael Sanz)". Aviation book "I Luften 2006 - Flygets Årsbok (Michael Sanz)". published in the Historical Aviation Magazine "Svensk Flyghistorisk Tidskrift no 3/06. Historical Magazine "Svensk Flyghistorisk Tidskrift no 5/06. Published in Historical Magazine "Svensk Flyghistorisk Tidskrift no 6/06. SAS Scandinavian Airlines Longrange A330-300 is rotating for yet another flight as SK903 to New York. Report for Year 2005, 2006. 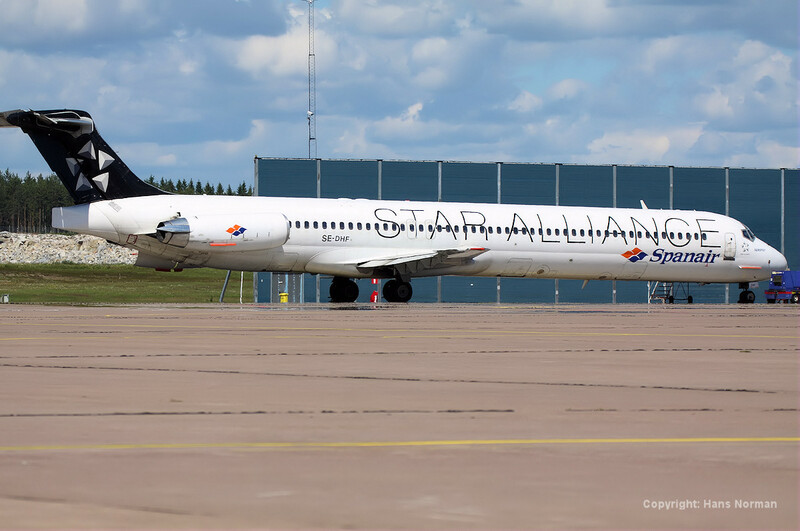 "Sundsvallsflyg" is a company selling air ticket in the Domestic Swedish market, and a Skyways Fokker F50 in special livery is used to operate some flights. Published in Swedish Historical Magazine "Svensk Flyghistorisk Tidskrift no 1/07. Aviation Historical Magazine "Svensk Flyghistorisk Tidskrift no 1/08". 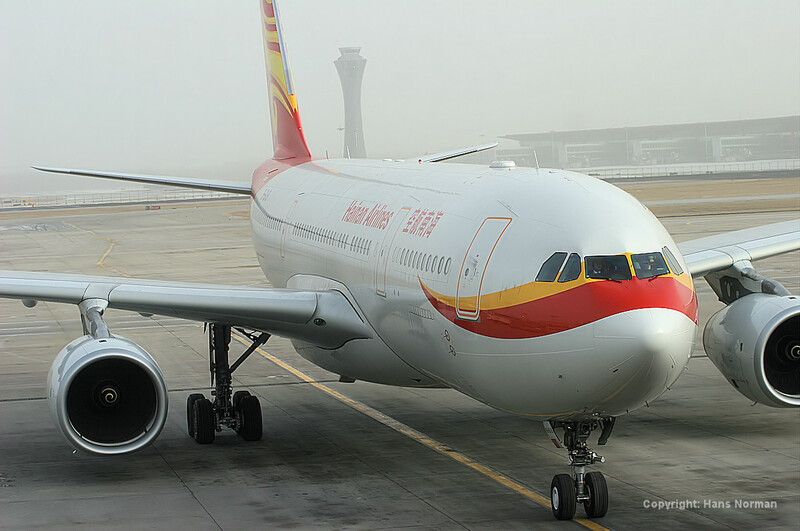 Airbus A330-243 to support this expansion. It will start services to USA in 2008/09. The photo was published in the "Airways - A Global Review of Commercial Flight, April 2008". TAM Airbus A330-243 on final to land at Paris Charles De-Gaulle in June 2005. The photo was published in the excellen book "Air-Britain - Airline Fleets 2008." at Arlanda. The photo was published in the excellen book "Air-Britain - Airline Fleets 2008." Rather dull Swedish summer whether, as OH-LVE made its first appearance at Stockholm-Arlanda in the "new" Convair Retro-colors. This photo was published in the Swedish Aviation Historical Magazine "Svensk Flyghistorisk Tidskrift no 5/08." 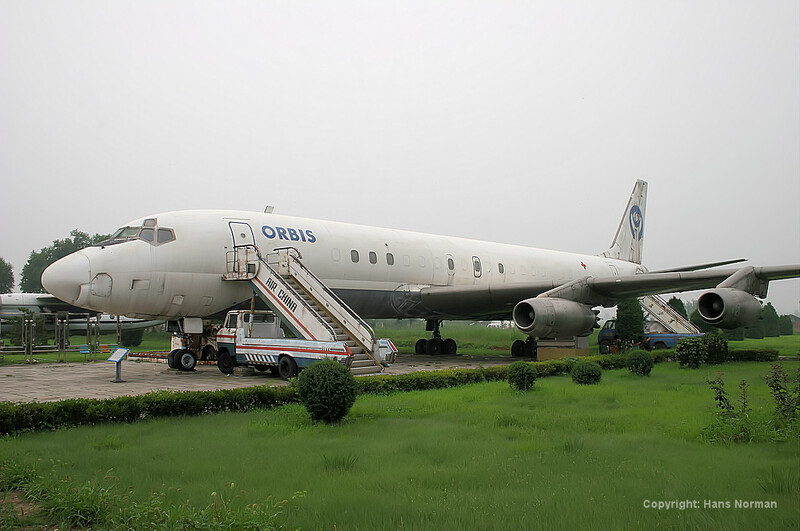 airplane will find a new life as a Airplane hotel "Hostel". This photo was published in the Swedish Aviation Historical Magazine "Svensk Flyghistorisk Tidskrift no 5/08." 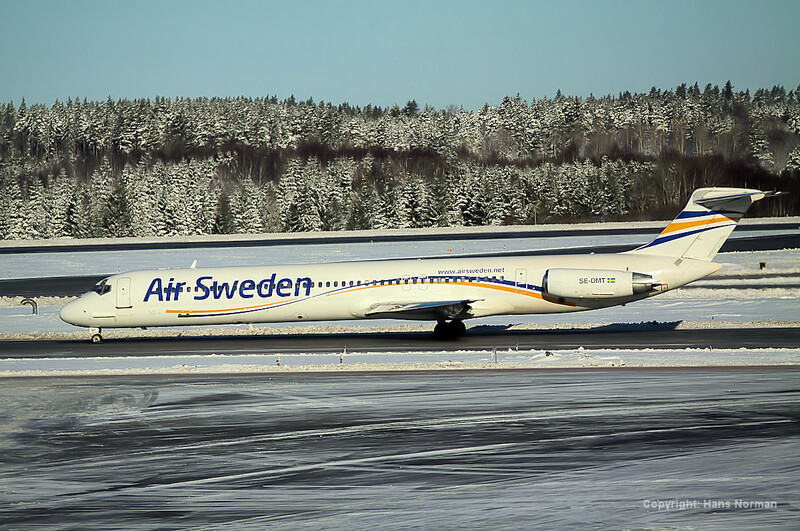 This photo was taken on a typically dull November morning at Stockholm-Arlanda. The photo was published in the Swedis Aviation Historical Magazine "Svensk Flyghistorisk Tidskrift no 6/08." book "Flygets Arsbok - Ett ar i luften 2009"
in the yearly Swedish aviation book "Flygets Arsbok - Ett ar i luften 2009"
was published in the yearly Swedish aviation book "Flygets Arsbok - Ett ar i luften 2009"
yearly Swedish aviation book "Flygets Arsbok - Ett ar i luften 2009"
The Shanghai Y-8 transport/cargo airplane was operating for a long time at CAAC, the predecessor of Air China. aviation book "Flygets Arsbok - Ett ar i luften 2009"
at the time. This photo was published in the yearly Swedish aviation book "Flygets Arsbok - Ett ar i luften 2009"
"Flygets Arsbok - Ett ar i luften 2009"
The Airbus A380 Giant made a flying dispay at the Airbus Family Day Air Display in Finkelwerder on Sep 5th, 2009. The photo was published in the "Airways Magazine issue January 2010"
no 2/09. The photo was taken at Stockholm-Arlanda terminal 4 in November 2008." 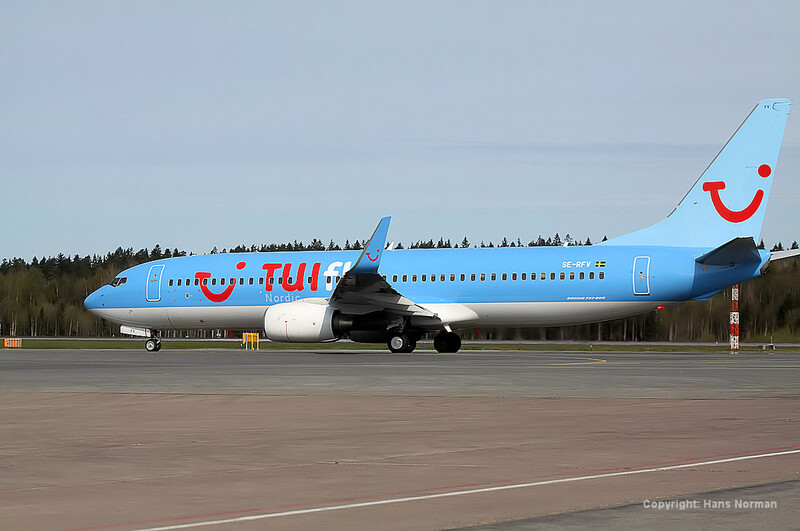 Brand new Boeing 737-800 SE-RFV has just been delivered to TuiFly (Nordic) as this photo was taken. 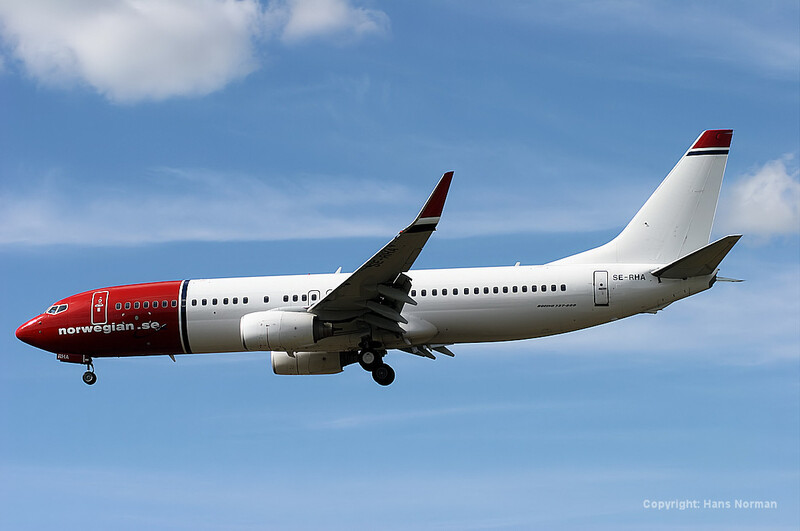 TuiFly Nordic operates an efficient mixed fleet of Boeing 737-800 and Boeing 767-300ER (with Winglets). 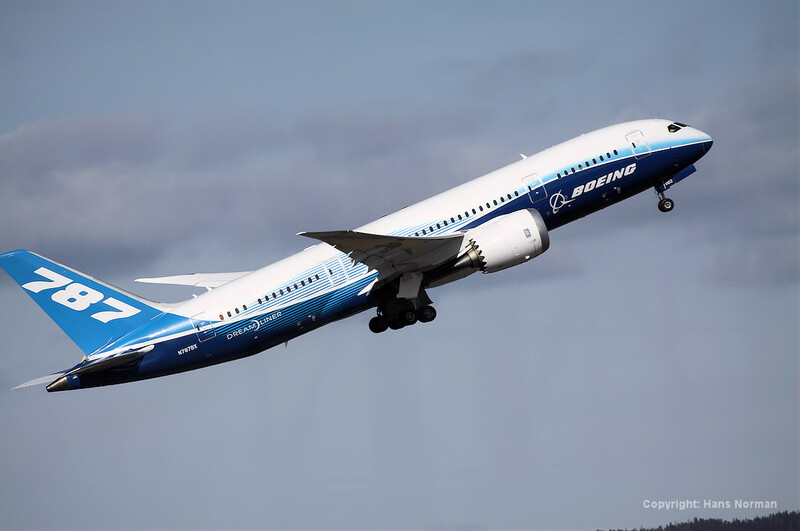 A Boeing 787 will be used from 2013. The photo was published in the Swedis Aviation Historical Magazine "Svensk Flyghistorisk Tidskrift no 3/11." in the Swedis Aviation Historical Magazine "Svensk Flyghistorisk Tidskrift no 2/09." 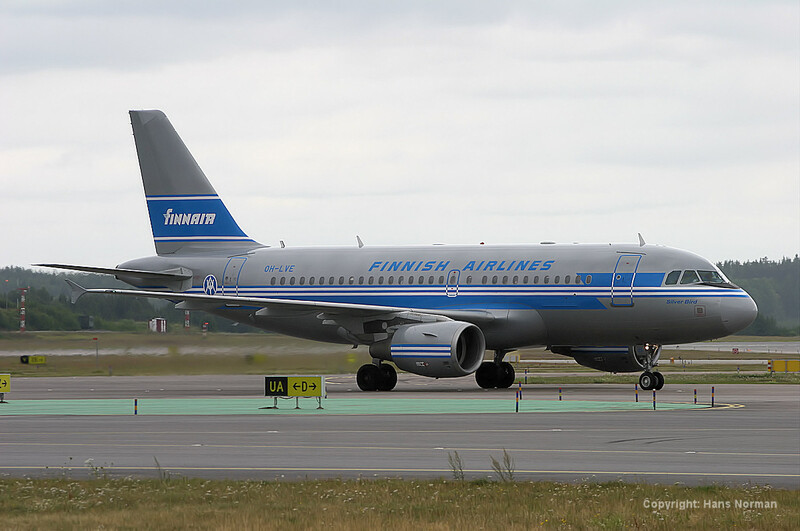 The former SAS and Swedish Airforce Caravelle is based at Stockholm-Arlanda Airport and has been painted in Finnair colors to take part in a movie about hijacking. 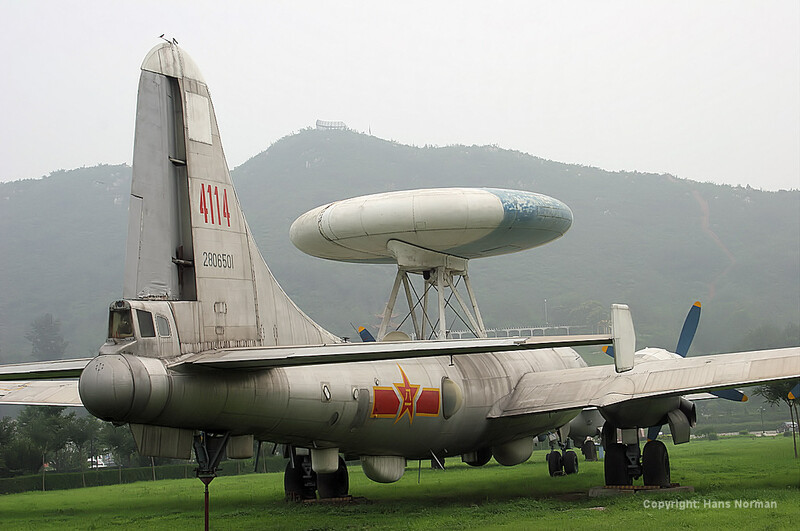 The photo was published in Airways Magazine issue June 2012." 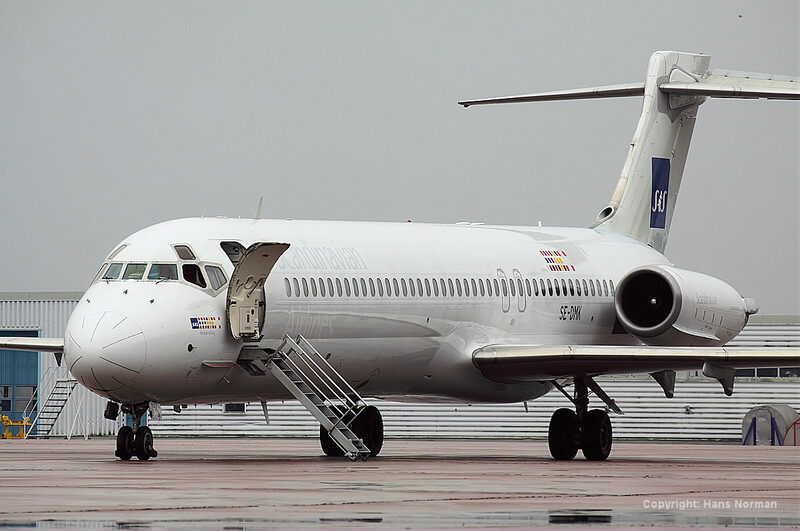 was MD-87 SE-DMM which was stored a short time at Arlanda airport, before being sold and ferried to USA. 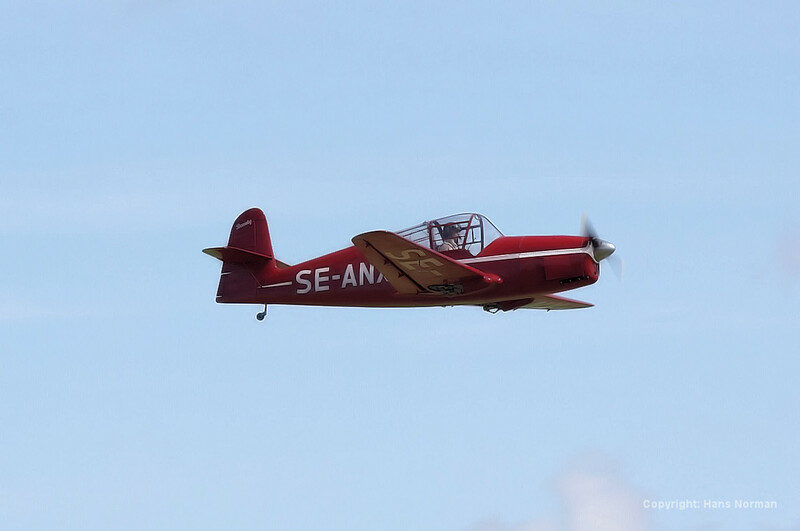 The photo was published in the Swedis Aviation Historical Magazine "Svensk Flyghistorisk Tidskrift no 2/12." of months of 2012, and can be seen here taxiing in after landing on runway 26 at Stockholm-Arlanda airport. SAS color-scheme before being put into service in december 2011. The photo was published in the Swedis Aviation Historical Magazine "Svensk Flyghistorisk Tidskrift no 6/11." 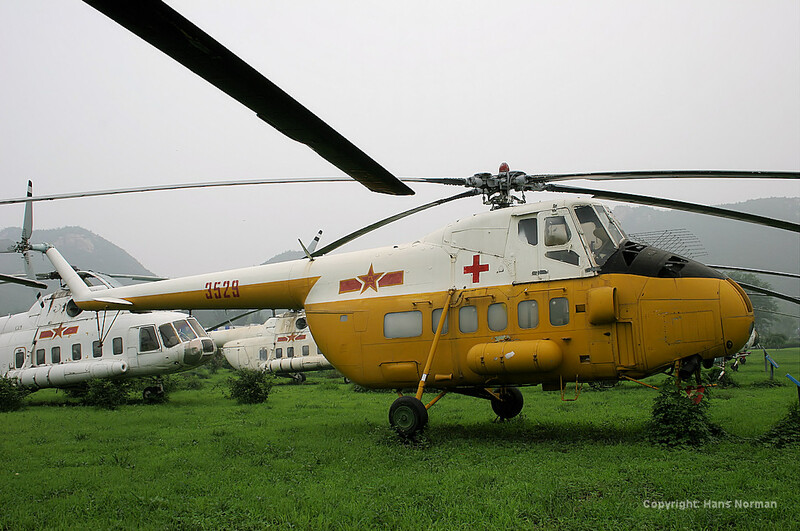 The photo was published in Airways Magazine issue February 2012." was published in the Swedis Aviation Historical Magazine "Svensk Flyghistorisk Tidskrift no 6/11." Scanair McDonnell Douglas DC-10-10 (msn 46646/285) SE-DHS "Baloo"
in July 1992. Scanair operated a total of five DC-10:s and the main destinations were sunny Spain and Greece. 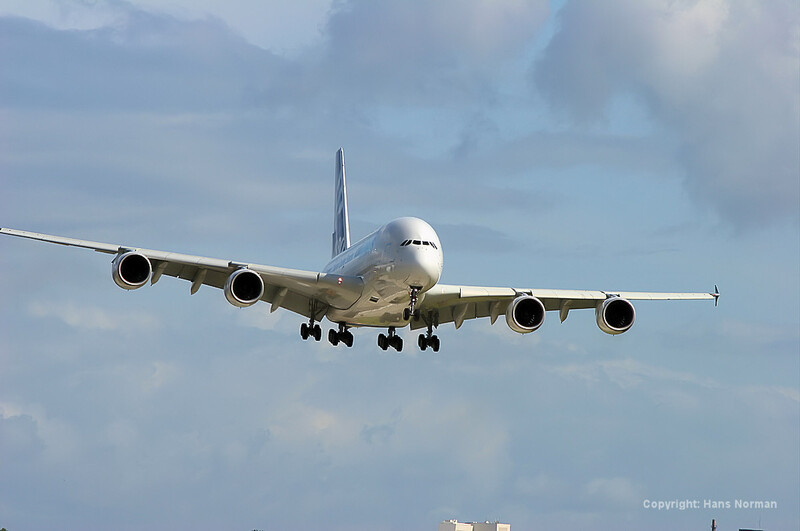 The worlds largest Airliner, the double-decker Airbus A380, was shown for the public for the first time at the 2005 Paris Air Show. A total of 20 main-gear wheels are needed to distribute the huge weight. 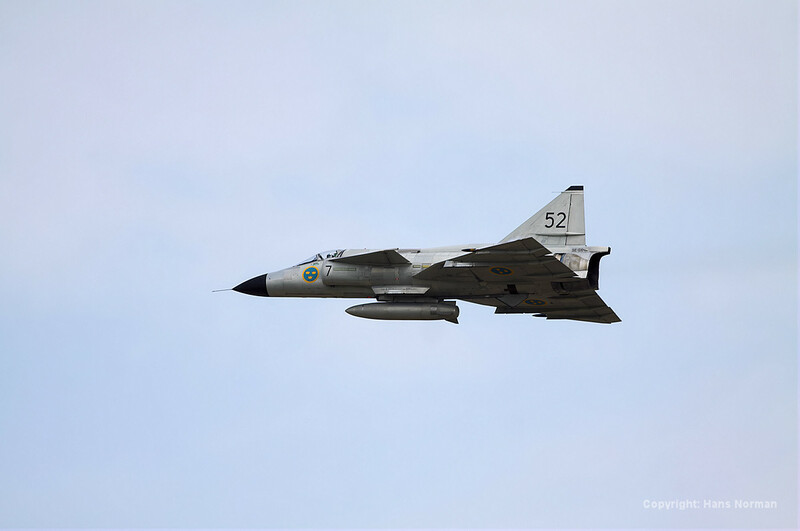 The photo was published in the book "SAAB-Minnen no 21" published by SAAB Aircraft's veterans club"
from the skies. In addition to operating MD-81:s, Air Sweden has also operated Airbus A320 before disappearing in 2011. 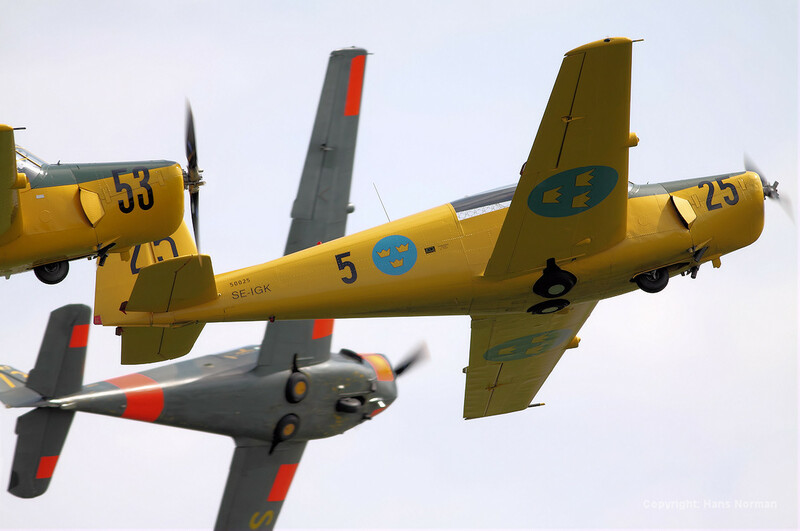 The photo was published in the Swedis Aviation Historical Magazine "Svensk Flyghistorisk Tidskrift no 2/10." 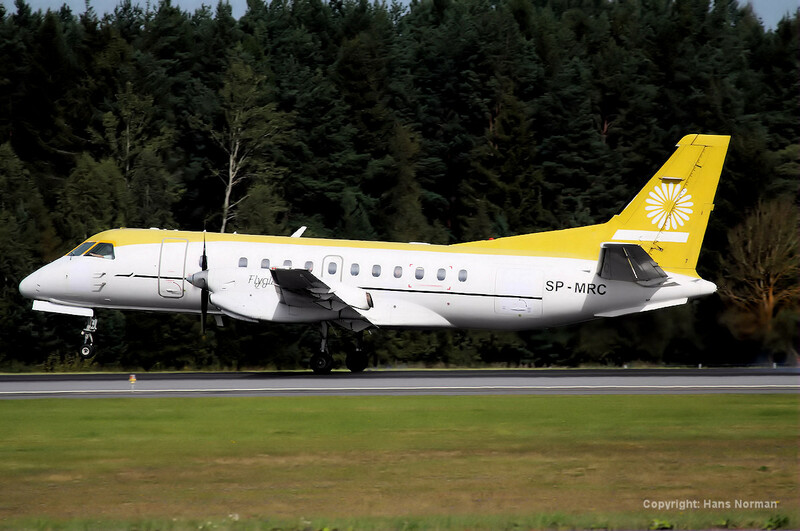 Golden Air is a reliable regional airliner operator and fly primarily Swedish Airplanes made up of SAAB 340s and SAAB 2000s. 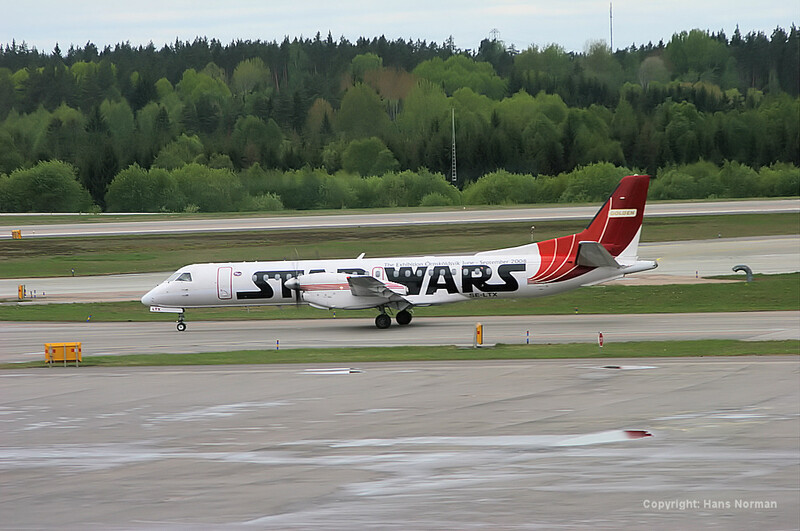 One of their bigger SAAB:s had a special livery advertising the STAR WARS move. The photo was published in the Swedis Aviation Historical Magazine "Svensk Flyghistorisk Tidskrift no 4/08." 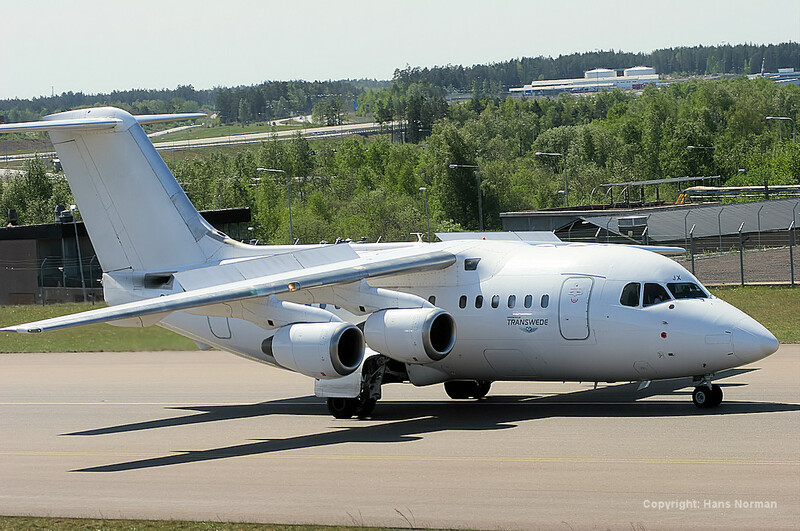 Definitely not a common sight of a Transwede Airplane: A white AVRO RJ-70 taxiing in after landing at Stockholm-Arlanda airport. As common in the airplane business, this was a fairly short-lived affair! by a Percival Pembroke. In splendid summer weather, this could not be better!!! The photo was published in the Swedis Aviation Historical Magazine "Svensk Flyghistorisk Tidskrift no 4/10." 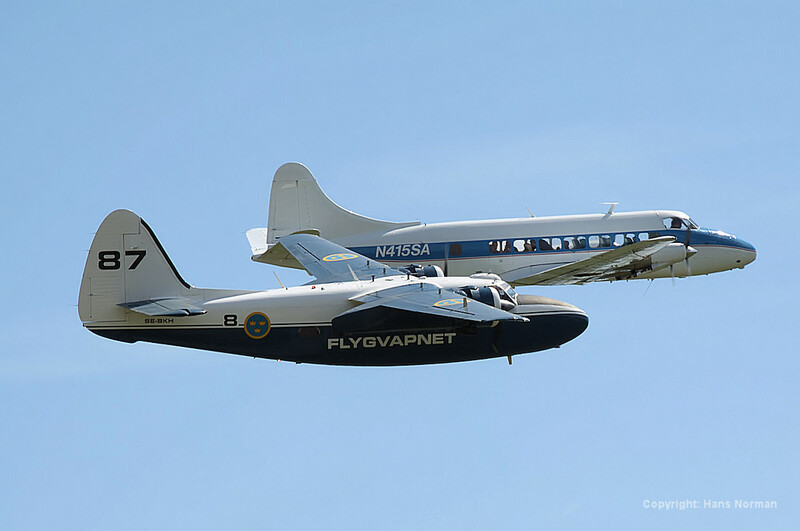 A historical occasion for the Swedish Home-built community, as the BHT-1 makes its comeback in flying condition. Beautiful airplane in beautiful colors. 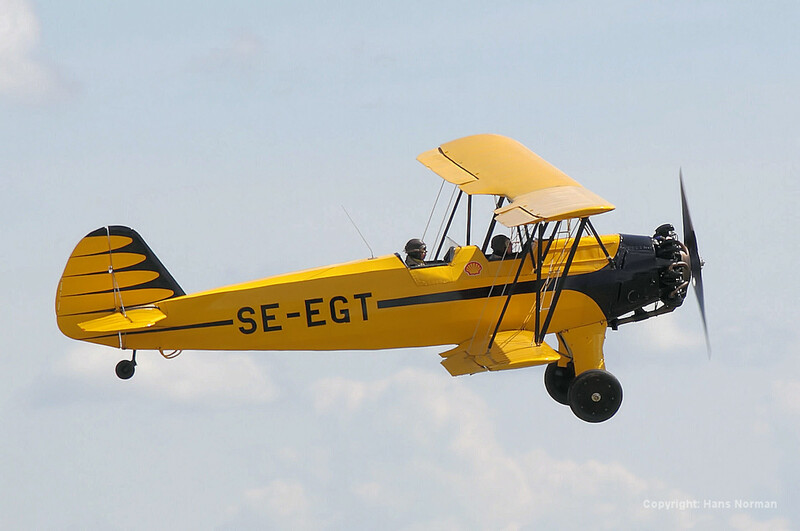 Another first at Vasteras Airshow 2010 was this Fokker Dreiecker built by the famous Swedish Aviator Mikael Carlson. Other famous airplanes in his collection includes Bleriot XI, Fokker Dr.1, Stearman, Tumelisa and more. 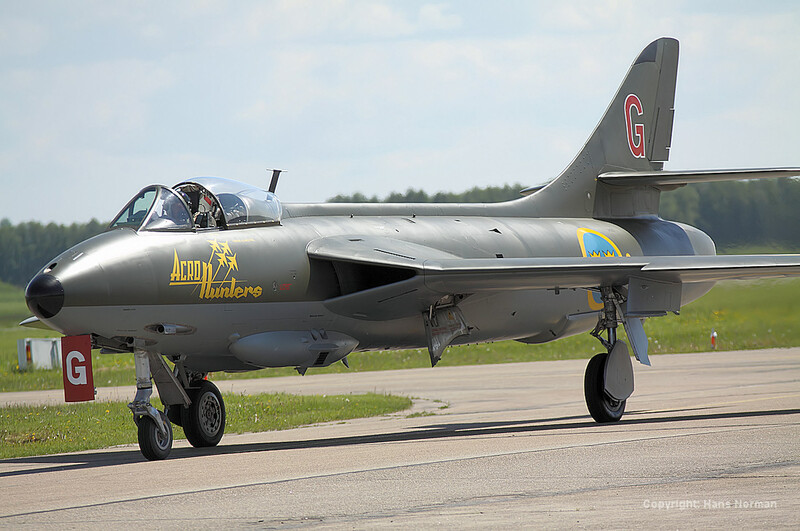 Hawker Hunter of the Swedish Airforce Historical Collection has been a frequent visitor to Vasteras Airshow and the year 2010 was no exception. Here taxiing in after a splendid flying display, this angle gives a good view of the aircraft. 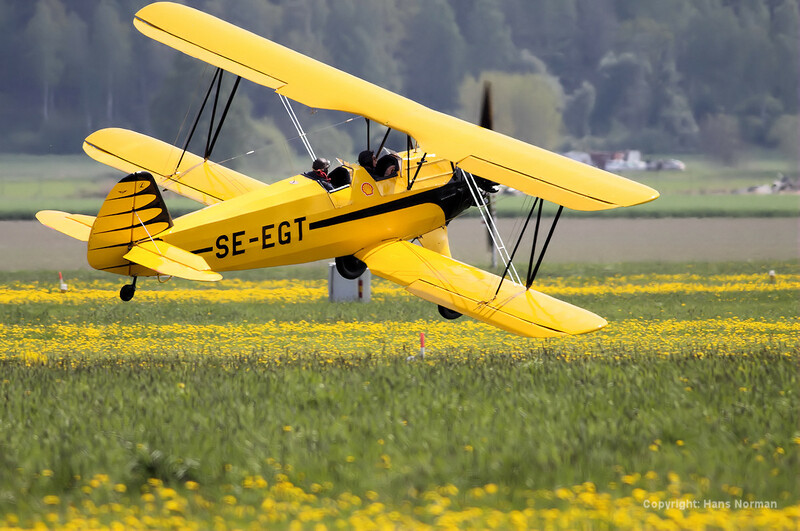 This Stieglitz is another frequent praticipant of the Vasteras rollout airshow. As can be seen it is in beautiful condition and is flying into the air like a bird! is based at Vasteras Airmuseum. 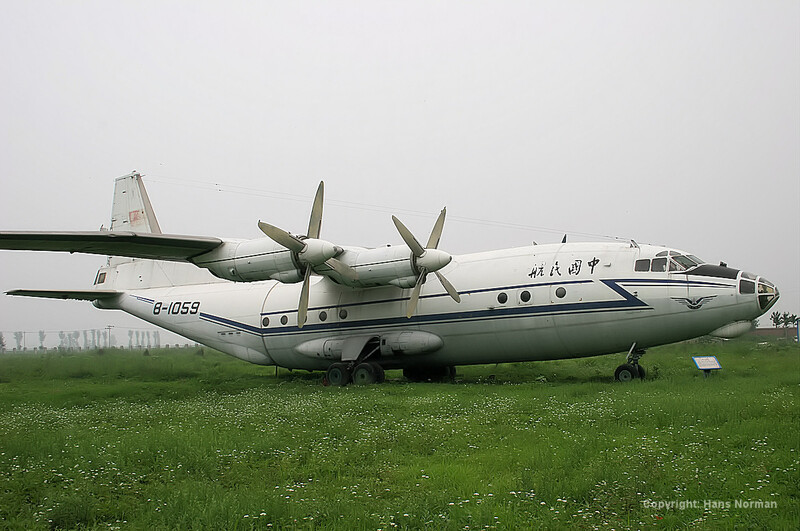 This old airplaned really looks in mint condition. 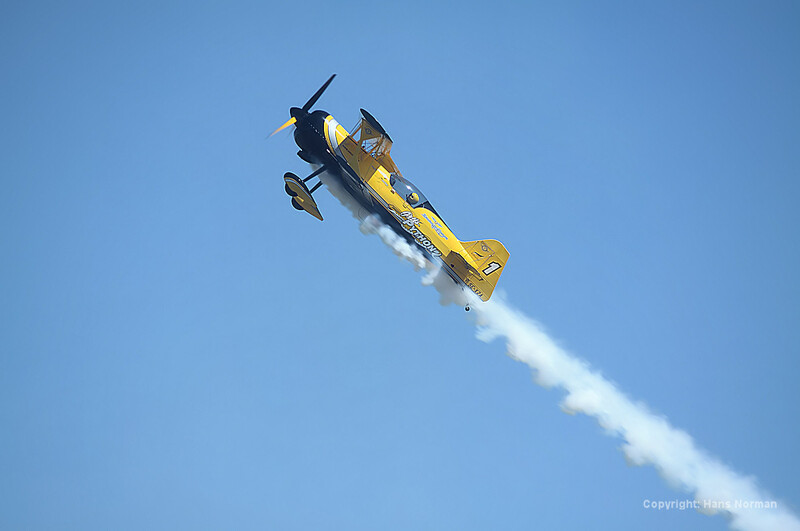 This Pitts aerobatics airplane is extremely agile and is shown to its best by pilot Jacob Hollander, who has his own "flying circus". 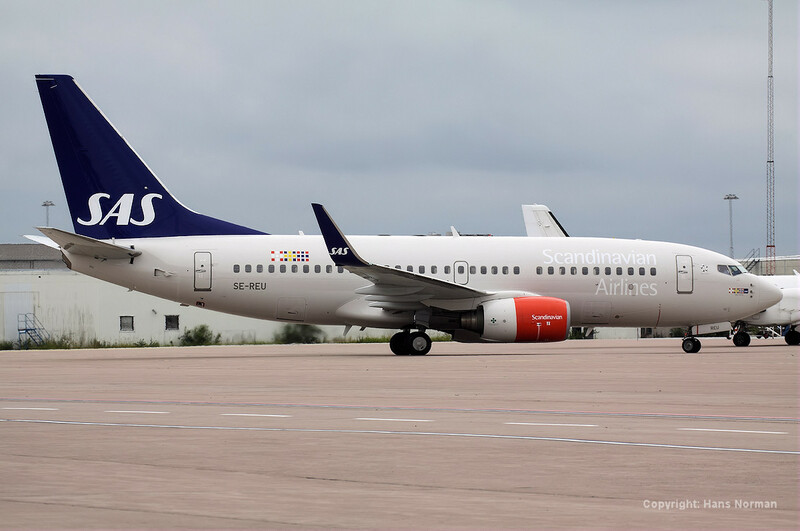 During 2012-2013 SAS acquired a batch of second hand Boeing 737-700s, the second of which was registered SE-RES and put into revenue service on May 2nd, 2012. 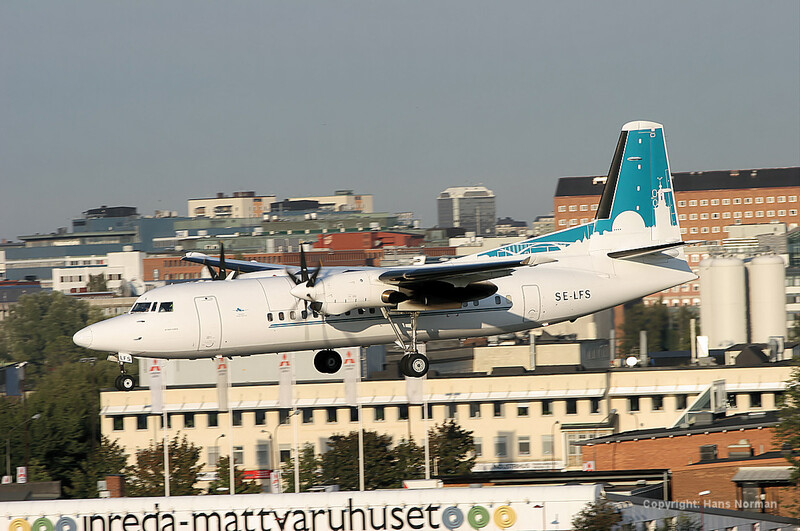 It can be seen here landing at Stockholm-Arlanda airport a couple of weeks later. The photo was published in the Swedis Aviation Historical Magazine "Svensk Flyghistorisk Tidskrift no 3/12." 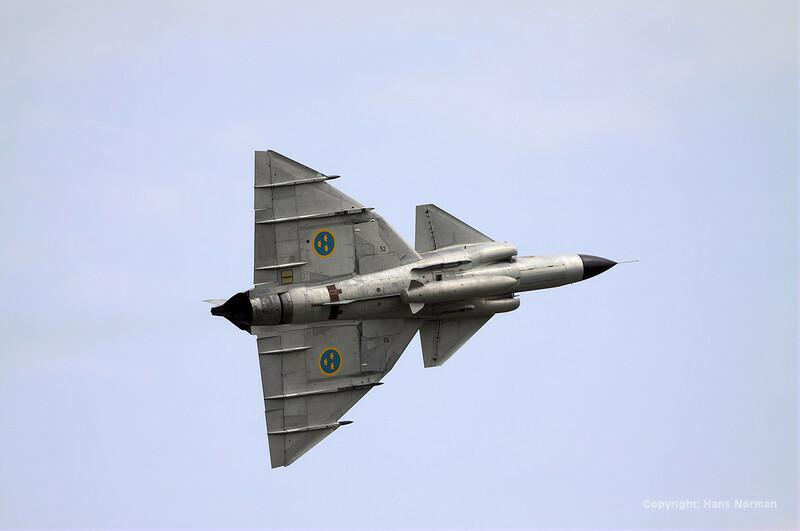 In spring of 2012, a civil registered SAAB 37 Viggen Military "Fighter" made its debut and made it marks on many Airshows that year. 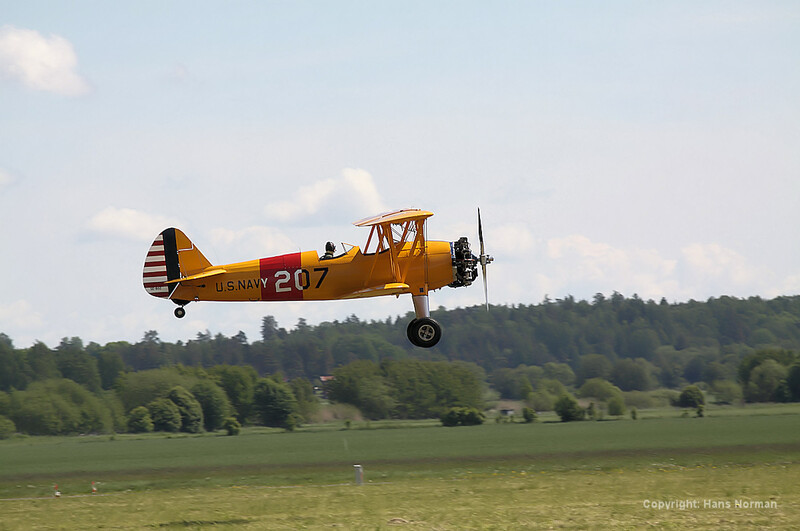 Here it can be seen in aerobatics at the Vasteras Hasslo rollout Airshow on May 20th, 2012. 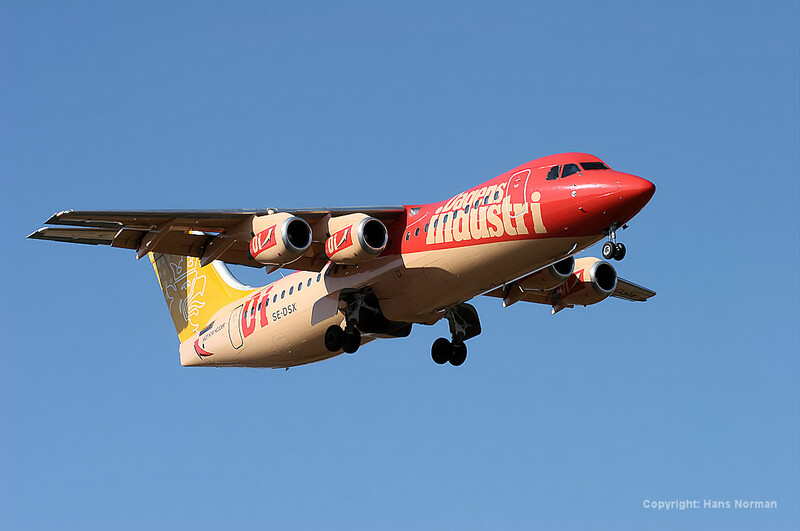 Its previous operator was Virgin Blue of Australia. The photo was published in the Swedis Aviation Historical Magazine "Svensk Flyghistorisk Tidskrift no 5/12." 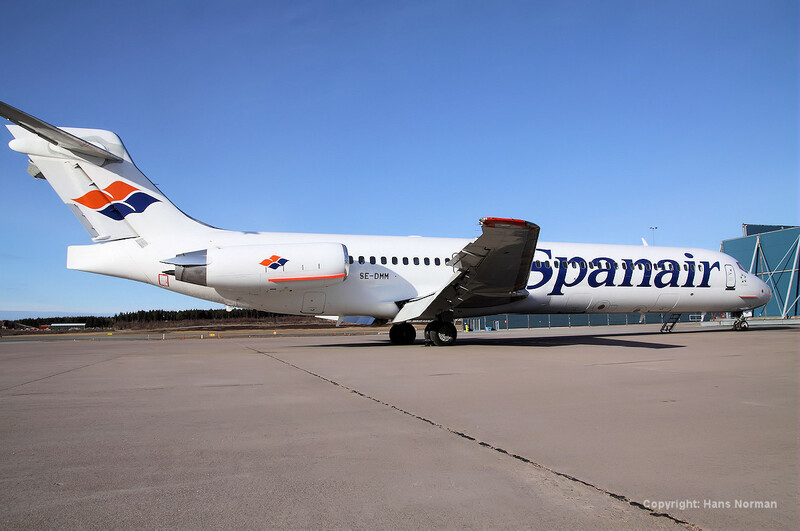 As a consequence of the Spanair Bankruptcy, a number of MD-83/87s was returned to SAS for onward sale to Allegiant Air in the USA. 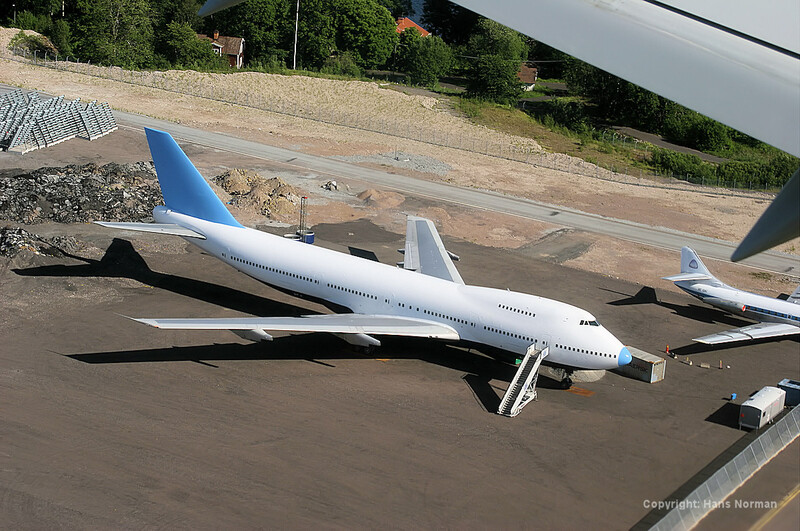 SE-DMP is seen parked at Arlanda ahead of delivery to its new owners. 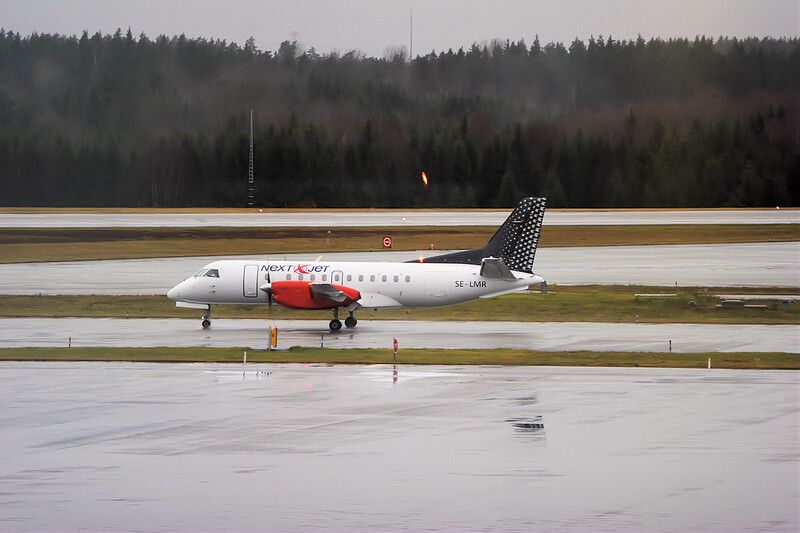 This Denim Air Fokker F50 was put into service on ACMI wet-lease to Höga Kusten flyg AB, on the Swedish Domestic market. 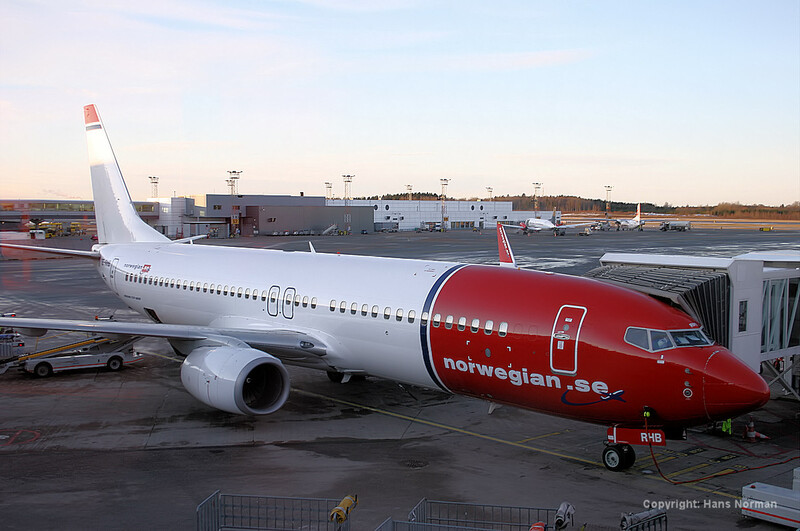 Operations was started on Aug 21st, 2012, and the photo was taken the same day at Stockholm-Arlanda Airport. between Kristianstad and Stockholm-Arlanda Airport where this photo was taken. 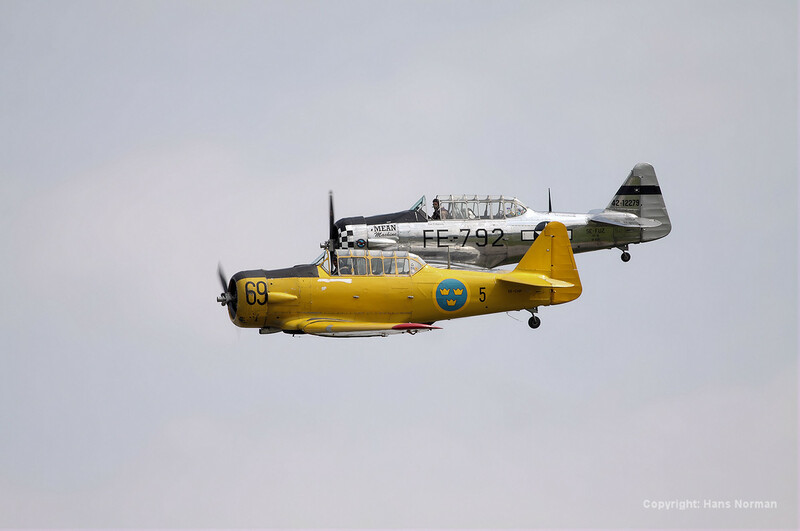 Two North American classical prop military trainers that used to serve in the Swedish Airforce, in formation during Västerås Airshow on May 20th, 2012. The photo was published in the Swedis Aviation Historical Magazine "Svensk Flyghistorisk Tidskrift no 4/12." 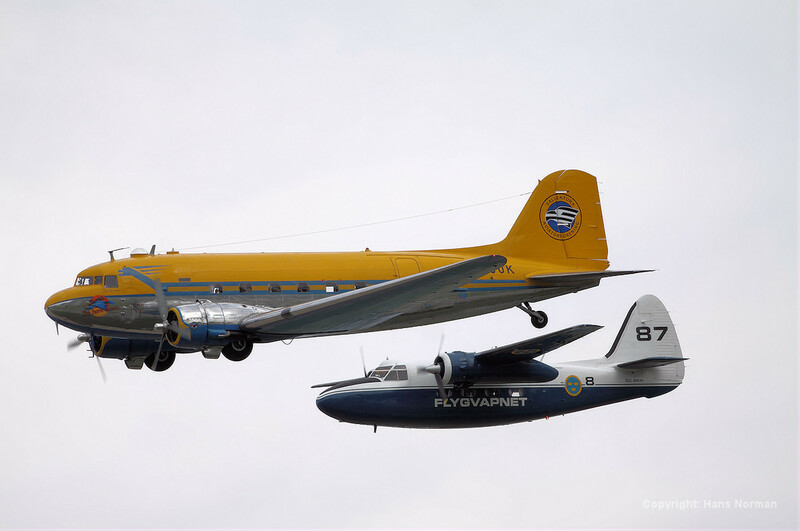 Two classical civil airliners of the past, a yellow painted DC-3 and a dark blue paintes Pembroke are chasing each other at the Vasteras Airwhow on May 20th, 2012. 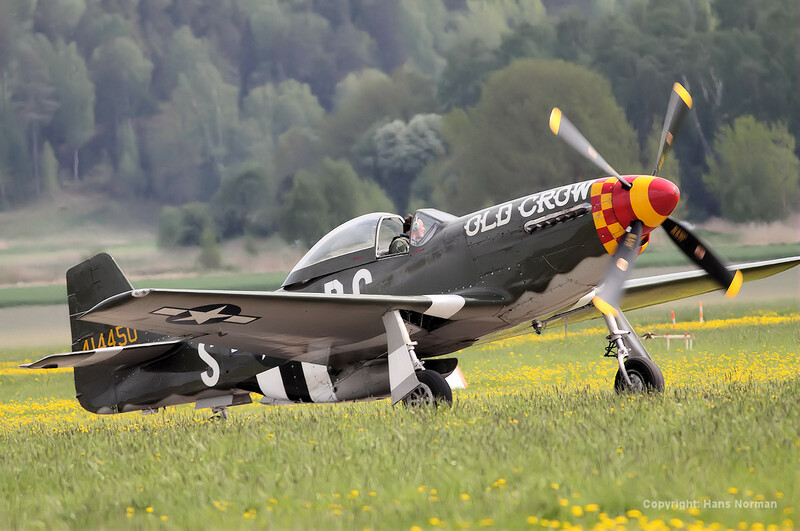 Splendid looking P-51 Mustang "Old Crow" taxiing in after a entertaining flying display at the Vasteras Airwhow on May 20th, 2012.
including a great flying display at the Västerås Air Show. to Västerås Air Show. 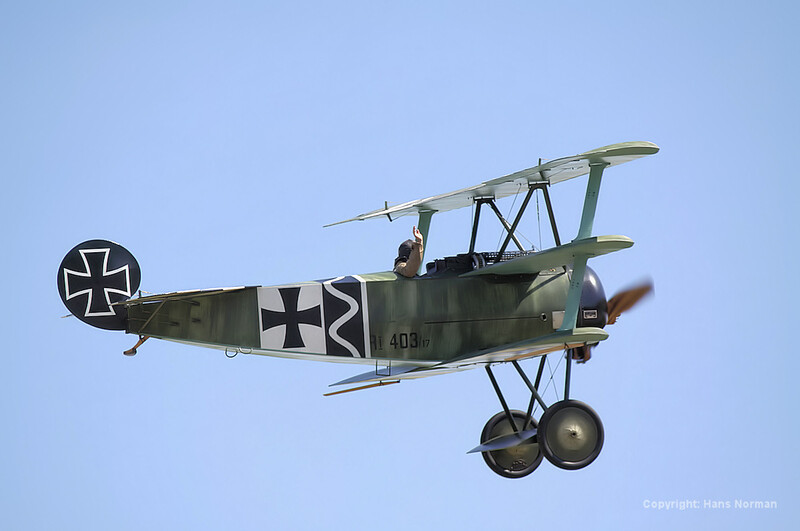 It is just about to land when a gust makes a challenge for the experienced pilot, Eberhard Jauer. A group of three SAAB SK50 Safirs shows its flying skills at Västerås Air Show. Two are yellow and one has the military dark green color scheme. 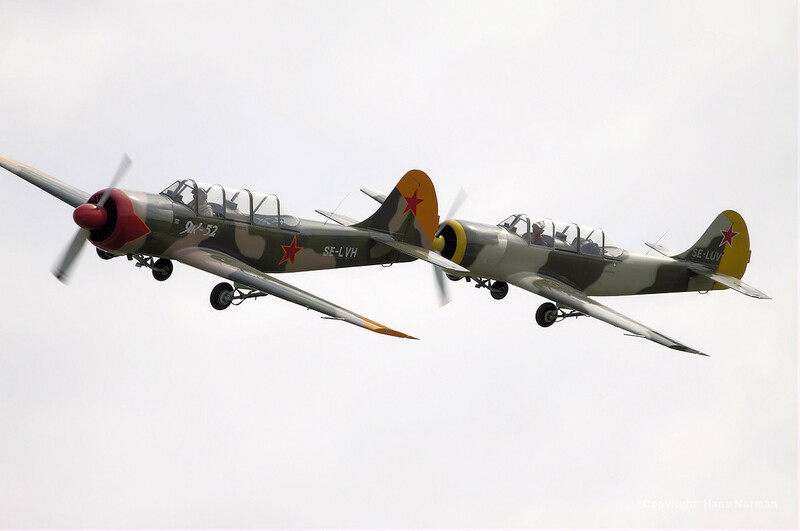 A group of two agile YAK-52 Aerobatic airplanes in formation just about to pass the crowd at Västerås Air Show on May 20th, 2012. The pilots are Eddy Holm and Urban Ryfors. 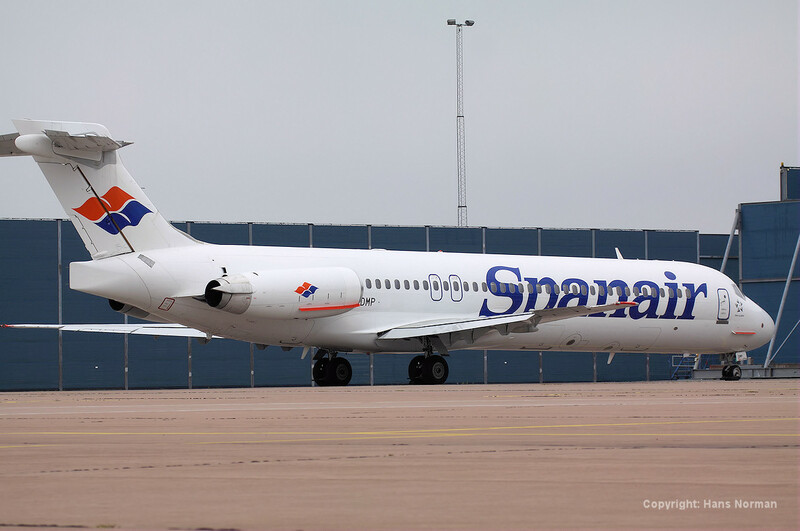 Spanair MD-83 SE-DHF waiting for delivery to new owner in USA on July 3rd, 2012 at Stockholm-Arlanda. 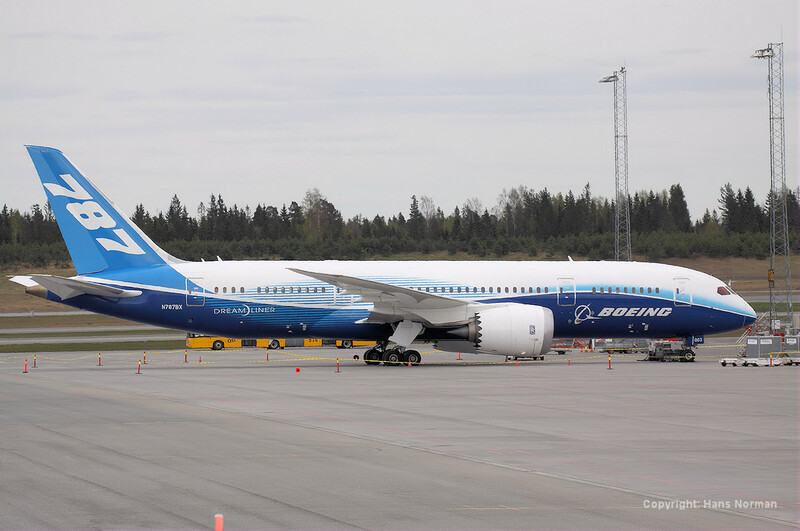 On May 1-4th of 2012, Boeing 787-8 N787BX visited Scandinavia for the first time when it was demonstrated for one of its first European Customers, Norwegian. 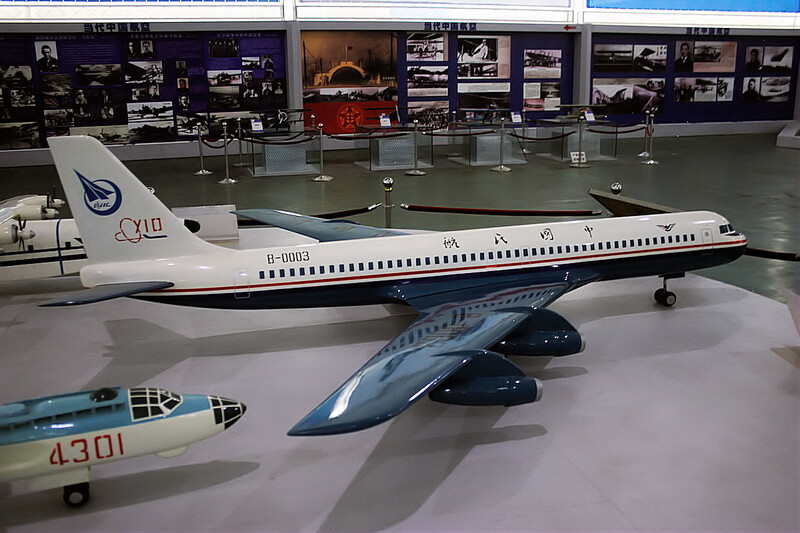 This was one stop on a world tour to demonstrate the airplane for its worldwide customer base.